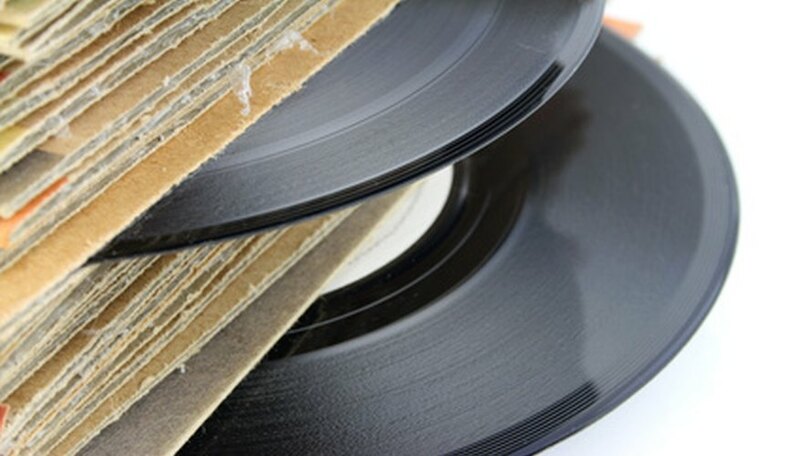 Vinyl records require regular care and maintenance in order to keep them dust-free and working properly. Making sure you clean them and handle them the right way is the only way to ensure they will still work on your record machine as they normally do. Make sure you have all the materials you need to manually clean the records before you begin. Prepare the vinyl record cleaning solution. Combine 1 gallon of warm distilled water, 1 cup of isopropyl alcohol, and 12 drops of the photographic wetting agent. Triton X-100 is highly recommended. Stir with a wooden spoon. Remove the record from its album cover very carefully. Pull it out by the very most outer edge. Handle it by its label or by placing your finger in the center of the record hole. Gently dust the record with a carbon fiber brush specifically designed for removing dust from records. Pour two gallons of warm distilled water into another clean bucket. Put on your gloves. Dip the record into the bucket with the cleaning solution by holding the record by its label. Place the record in the bucket containing only the water in order to rinse it off. Dry the record very carefully with a soft cotton cloth. Place a string of fishing line through the center hole, and then tie the string to a hook or another fixture in order to let the record hang and air dry. Handle with care and try to hold the record by its center hole. Hold it by its label near the outer edge if necessary.